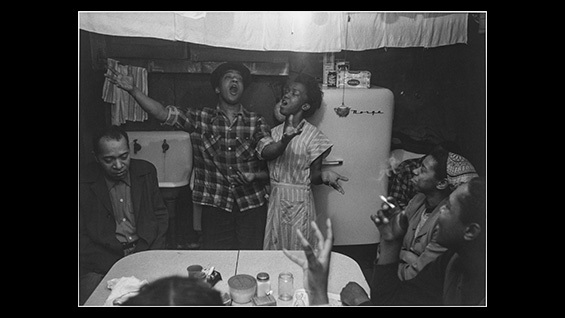 A Radical Vision: Roy DeCarava’s "The Sweet Flypaper of Life"
Join us for an evening of discussion and analysis of the place of Roy DeCarava’s A'40 oeuvre in American art with a special focus on the much-anticipated republication of The Sweet Flypaper of Life by First Print Press in fall 2018. This volume, which DeCarava created with the poet Langston Hughes in 1955, has been out of print for over thirty years and will be distributed worldwide by David Zwirner Books, D.A.P., and Thames & Hudson. Leading up to the centennial anniversary in 2019 of the artist’s birth, the panel will be moderated by Thelma Golden, director and chief curator of The Studio Museum in Harlem, and will feature noted artists, critics, scholars, and colleagues well versed in DeCarava’s work, including younger artists inspired by its visionary creative reach. Panelists include writer and critic A.D. Coleman; Radiclani Clytus, independent filmmaker; Leslie Hewitt A'00, Assistant Professor at The Cooper Union School of Art; John Stauffer, the Sumner R. and Marshall S. Kates Professor of English and African & African American Studies at Harvard; and photographer Hope Wurmfeld. The panel will offer a perceptive range of analyses of distinct individual images and explore the themes that bring these pictures into a broad revelatory context. The Sweet Flypaper of Life—which honors in words and pictures what the authors saw, knew, and felt deeply about life in their city—can be appreciated as an unconventional collaboration around universal themes and remains a volume unique in the canon of visual literature. The panel discussion will provide an opportunity to explore the contributions of DeCarava’s work in Sweet Flypaper within the larger context of American art. With one of the longest and most prolific careers in American photography, DeCarava remains inexplicably underknown to the broader public. His photography speaks of the distinct issues of his time and his medium while reaching deeply within to produce relational and creative imagery. Viewed through the prism of this groundbreaking book, the panel will plumb the meanings and metaphors present in this classic volume as well as reflect on the true bearing of a creative life.